We save Waimea Canyon to near the end of the trip, and was it ever worth it! First, the canyon is amazing - there are sever lookouts that give spectacular views of the huge hole in the ground. Some of the tourist papers (promoting tours) claim Mark Twain called it the "Grand Canyon" of the pacific, others said he never visited the island (but did Hawaii), so the quote may be a fabrication. The drive from our Hotel in Kapa'a was about an hour, and then we started on the narrow winding road up. Once we were most of the way up, we joined a much larger road (Where did that come from), and the route along the ridge (Ocean on one side, Canyon on the other) had several Lookout points, all worth stopping at. Once you pass the Canyon, you head into the park headquarters (really good books available there), pass some permanent camps, and past several parking lots for hiking trails. We went for hike (roughly 2 hours) had lunch, and then continued driving north. Once we passed the hiking area we came to some spectacular lookouts on the Na Pali coast. 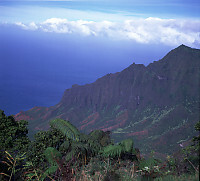 Their are two lookouts, the Kalalau Lookout and further up, the Puu O Kila Lookout. The views are breathtaking. We were so tired from out hike, we left before sunset. This was a great day on the island. I love the Waimea Canyon, it is so incredibly beautiful. I wanted to hike the swamp while in this area of Kauai, but we simply ran out of time. But we did have some lovely photo ops, like you.